The Eatwell 5 Meal Digital Pet Feeder is a battery operated feeder that automatically delivers food, treats or medication at any time you choose. The easy-to-use LCD display and dishwasher safe feed tray make it easy to set feeding schedules and clean up after meals. It can be set to feed your pet 5 small meals a day or even set up your pet’s meals for the next 5 days. 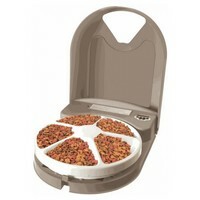 Each compartment holds up to 236ml of dry food, which makes portion control easy to manage for overweight pets.